November was a bad month for cycle casualties, with several tragic accidents reported in the press. 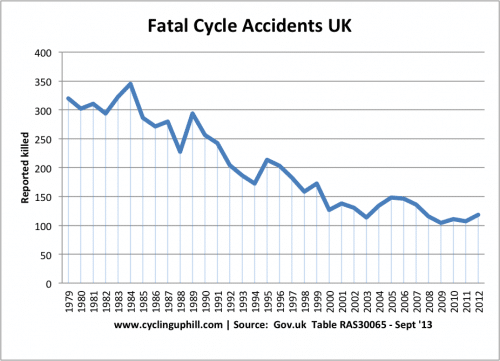 If we include all serious accidents in addition to fatalities, there has been a stronger upward trend since 2003. If we look at cycle casualties per billion miles cycled, the situation looks less promising. 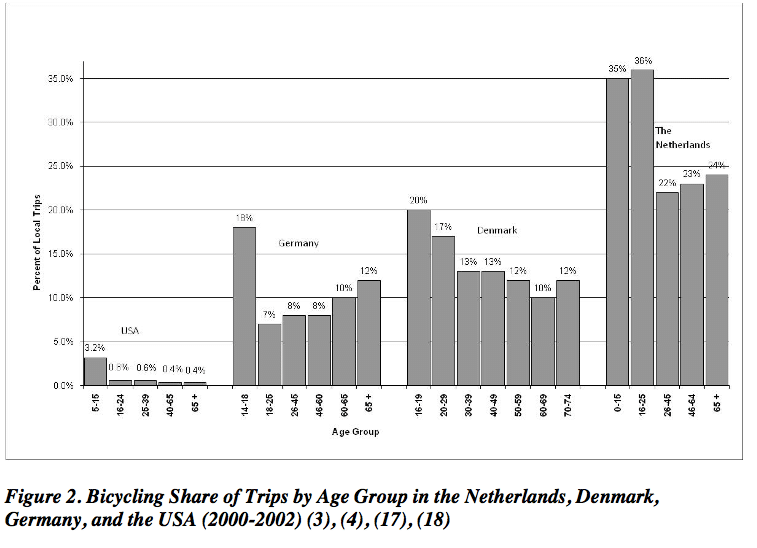 There was a significant improvement in cycle rates in the 1980s. 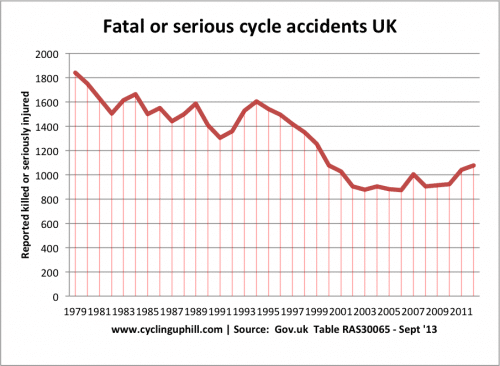 But, the increase in cycle rates since late 1990s appears not to have caused the hoped for ‘safety in numbers’ we might expect. 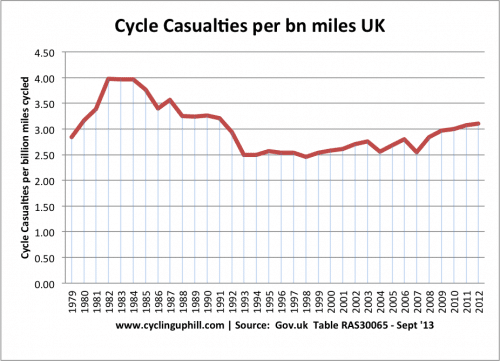 This shows that cycle casualties per bn miles cycled is increasing in the past decade. These statistics show casualties per billion km travelled. 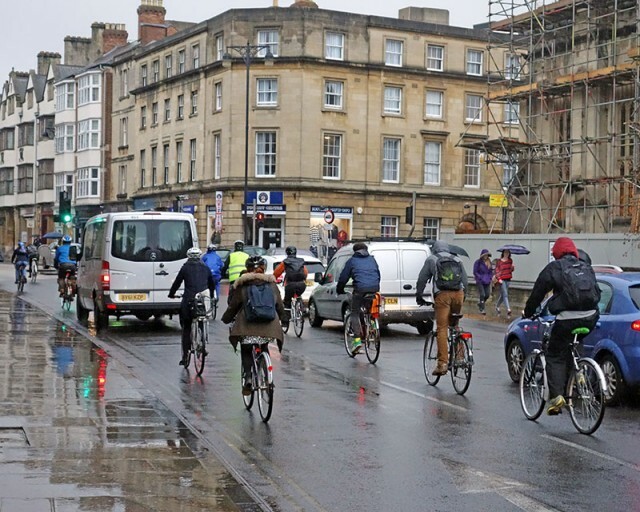 They produce a slightly skewed figure in that car drivers will clock up many miles on motorways, which tend to have much lower accident rates per miles travelled, compared to rural and urban areas. 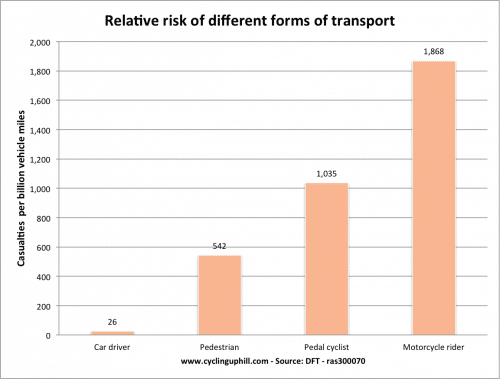 Nevertheless, it still shows how much safer car journeys are compared to cycling or walking. Which is to be expected. 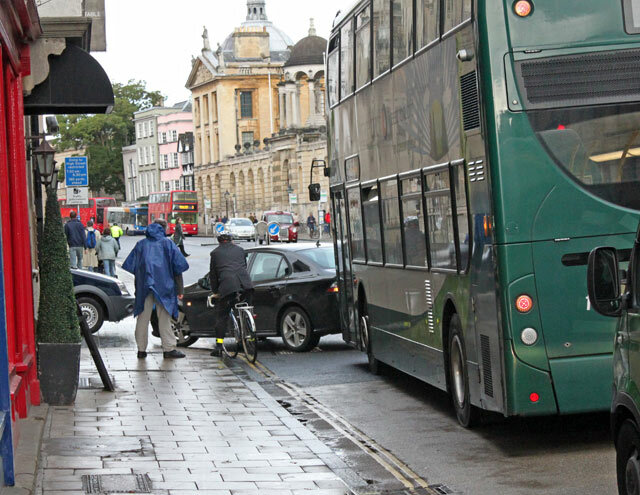 In a car you are protected by crumple zones and a block of steel. 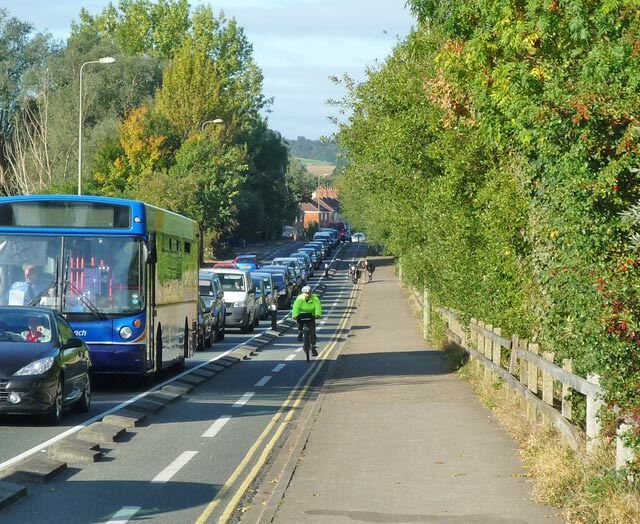 Walking and cycling, you are not. I was looking through my blog for posts of the past two months. It has been all about racing up hills or reviews of light-weight (and expensive) components. A very small niche of a sub branch of racing cycling. (Apologies if you have got bored of blog posts about weighing saddles and racing up steep hills). 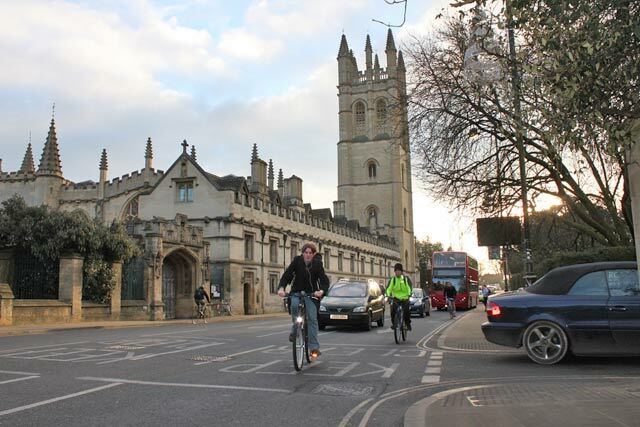 But, as well as being a racing cyclist, I’m also a commuter and cycle into Oxford every day. The curious thing is that the more I’ve got into racing, the slower I’ve got on the commute into town. When I didn’t do proper races, I remember racing to and from work. It was all about speed. I think I may even have timed my commute home, and tried to beat my personal bests. 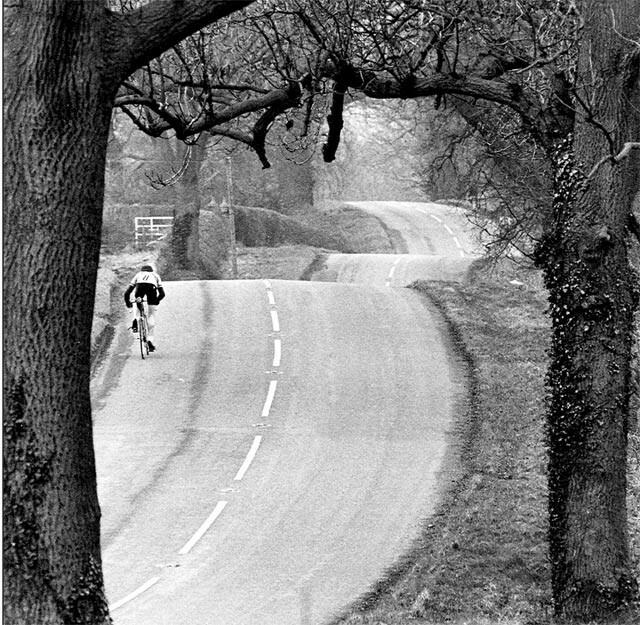 – (A timetriallist in the making, if ever there was) But, as I’ve got more into racing, I’ve slowed down when cycling into town. I’ve not sure whether this is me getting older, needing more recovery time or just a different attitude. With racing at the weekend, I don’t have any smouldering competitiveness or fresh legs during the week. 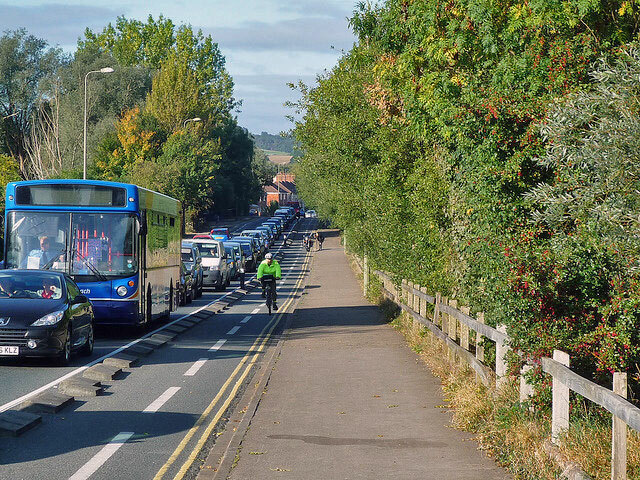 If you can ride at 30mph on a dual carriageway on a Sunday morning the desire for racing down Cowley road on Monday morning soon dissipates. 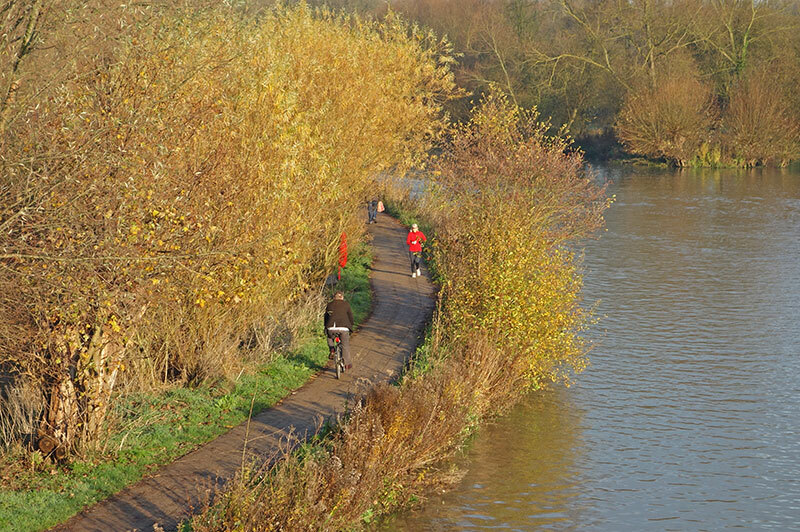 Slow recovery rides are good for you. As I mentioned in previous post, I used to do recovery rides at 18mph, now I do them at 14mph. To get a real recovery ride, you need to really go properly slow – either full on hill intervals or proper recovery is the motto today. Patience is a virtue which is surprisingly enjoyable. 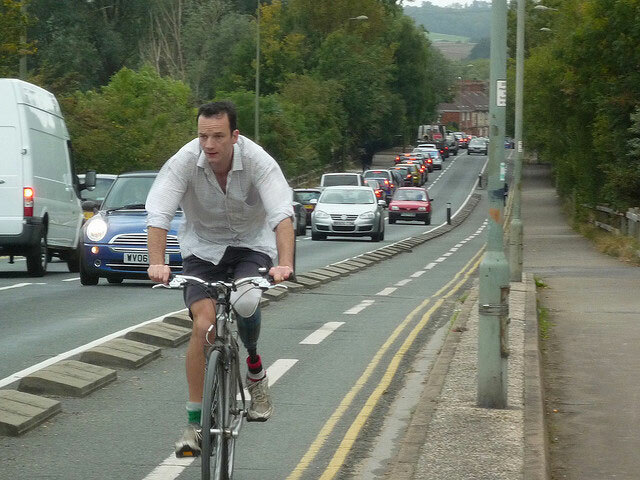 In the past, when I got in any mode of transport, it was always a race against time. 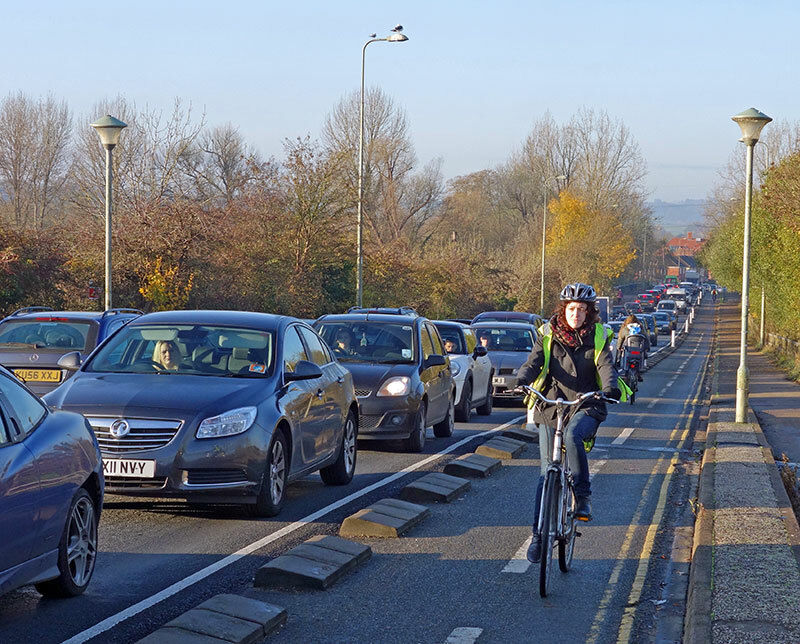 As a consequence, it was very easy to become frustrated at having to wait, getting held up or crawling along due to congestion. With this mindset of speed, you start to look for short cuts, the quick overtake, the dash through traffic. But, if you change your approach and try to enjoy the journey, it’s less stressful; you don’t feel guilty for standing still waiting for traffic to move. You just wait your turn. With all the evangelical fervour of a converted sinner. 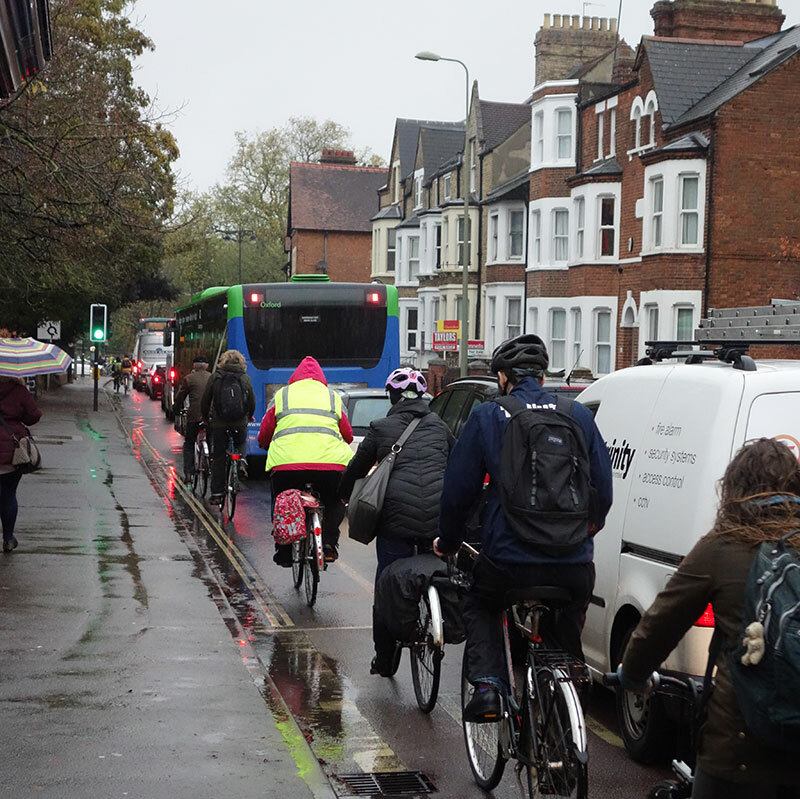 I now get incredibly frustrated when motorists are similar impatient to overtake cyclists in dangerous manoeuvres – you always want to preach to the unconverted to tell them – if they could happily wait for the odd 10 seconds, it really doesn’t have to ruin their day. 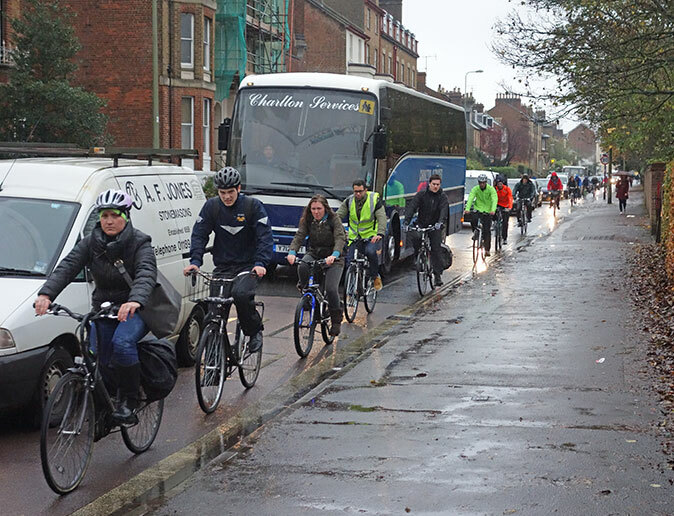 Take it easy, wait 10 seconds – and everyone’s happy. 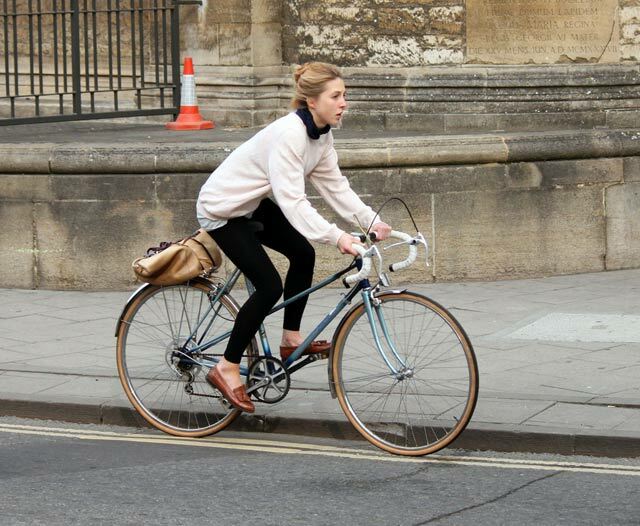 So slow cycling is good for you. 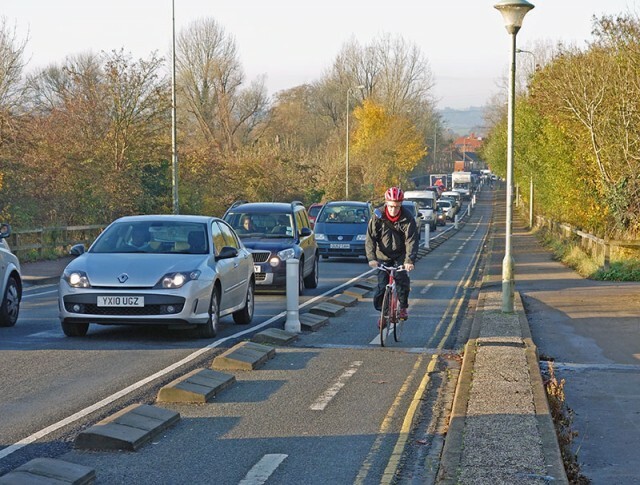 It makes you more considerate road user, but more importantly if you have a little more patience – you will enjoy the experience a lot more – if you give yourself an extra few minutes to get anywhere, you don’t have to squeeze through gaps which are really not advisable. 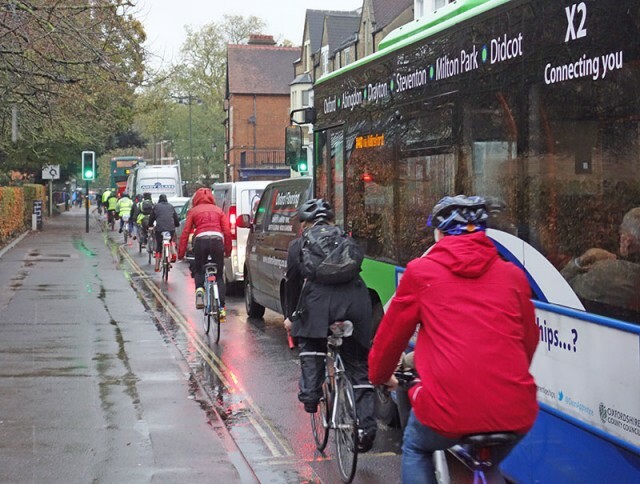 I was happy to hear it’s cycle to work day. I saw some signs advertising it near Rawdon, Leeds a few days ago. 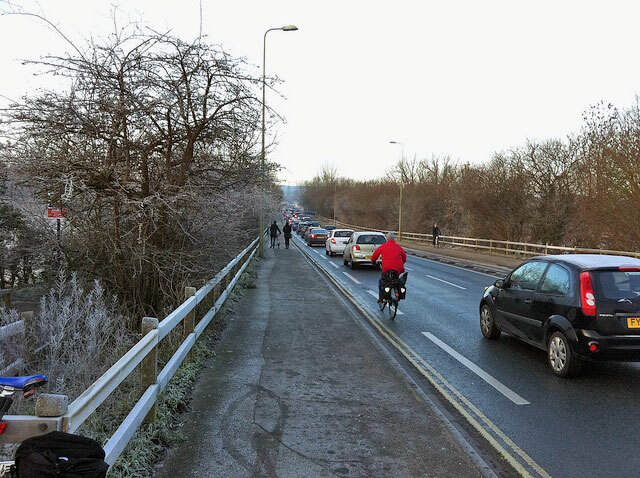 I didn’t notice any difference on the commuting roads of Oxford today, but hopefully a few people were inspired to dig out in the bicycle from their garage and cycle to work. 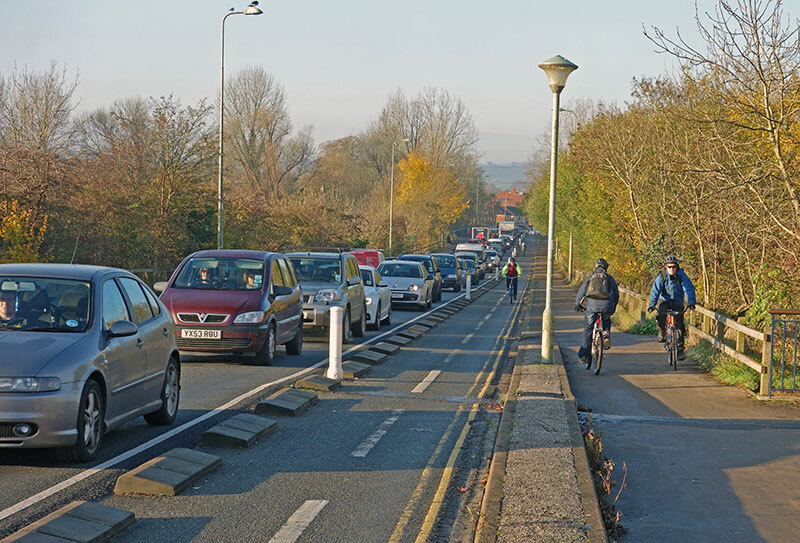 I’ve been cycling to work for the past 13 years (I used to be a teacher starting at 8 or 9am. But, these day I call work – going to a cafe for 9am to write some economics). 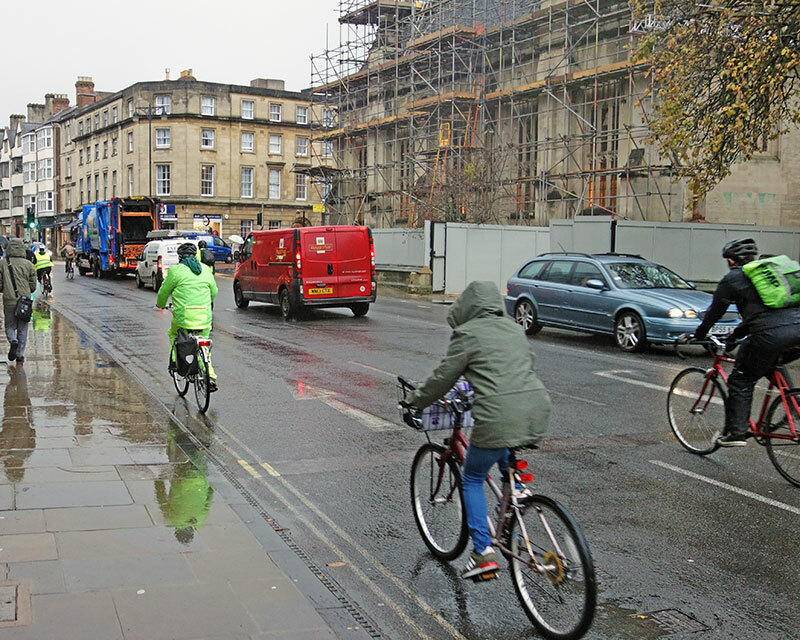 Even though I work from home, I still like to create a cycle to work in town. I’ve only ever been late once (when I fell off a slippery manhole and lay on the ground for 15 minutes. 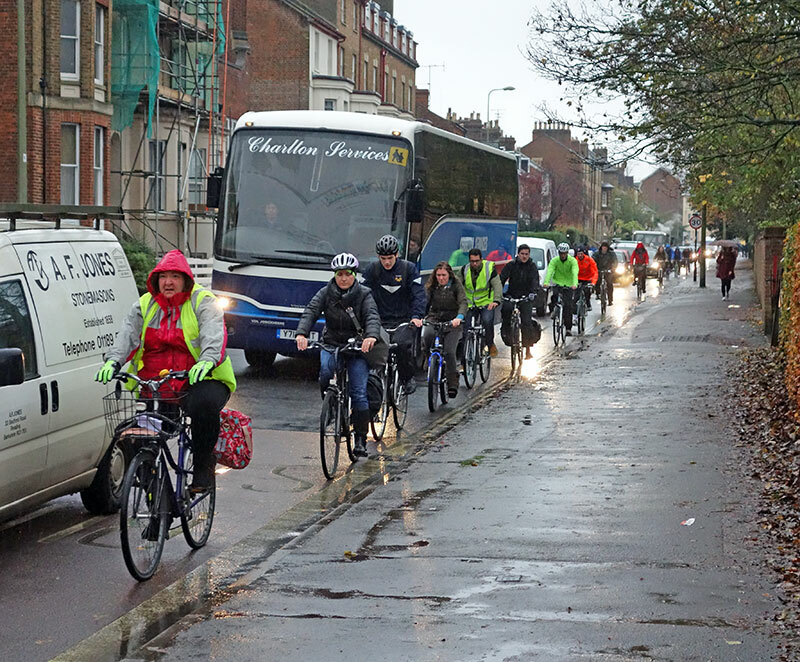 Perhaps I also got a puncture once and had to go in by bus, but that is a very distant memory. The bike is very reliable – ust avoid those cheap tyres you may get on a £100 bike from Cycle King. In those 13 years, I’ve saved a lot of money. An alternative is the bus. 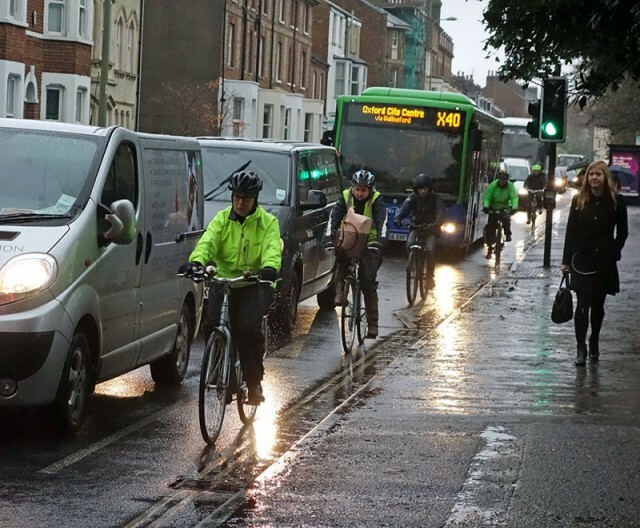 Roughly the bus costs £3 return 13 years * 200 work days a year = 2,600 days. 2,600 * £3 = £7,800. £7,800 – Wow, that is nearly enough to buy a new bike. 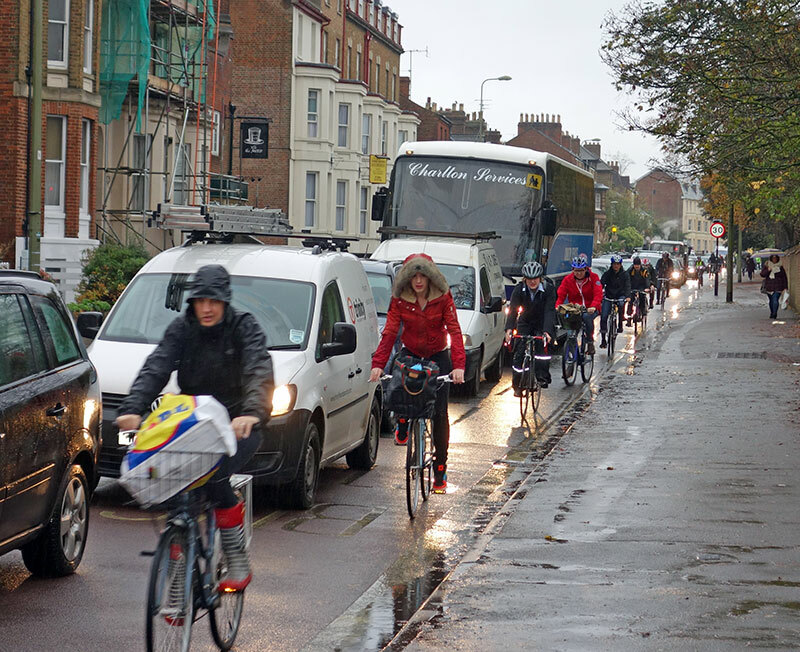 In those 13 years, I’ve had only two commuting bikes. (one got stolen). My current commuting bike is quite low maintenance. Every year, I spend about £70 for service at Reg Taylor cycles to get a new cassette, chain and brake blocks. Overall, I must be in profit by about £6,000. By the way, if I’d driven into town, I would have faced a car parking charge of over £10 a day before even petrol and all the costs of a car. I’ve never tried working out how much it would cost to drive into town. I’m a great believer in expensive car parking charges, but that’s another story. 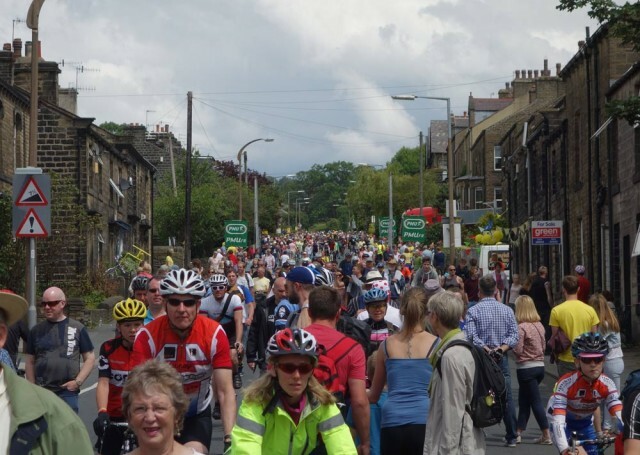 Everyone seems to agree that the Tour de France in Yorkshire / England was an unprecedented success. 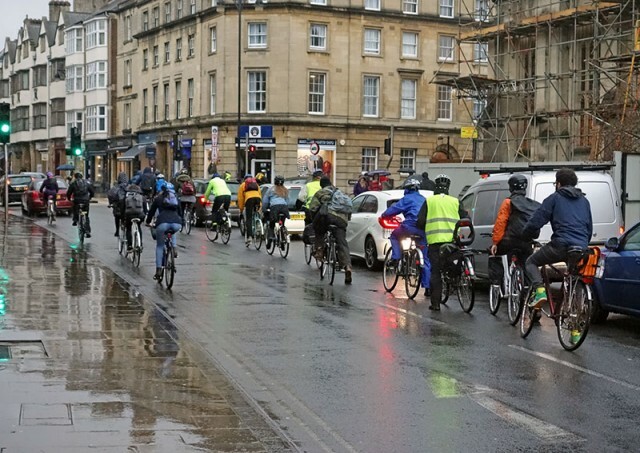 But, will it be a one hit wonder or will the legacy of the tour help boost the long term profile of cycling in the UK? As the tour swept through Britain, you could see potential seeds of a real cycling legacy which could offer many benefits to the nation. And these could be real benefits like improved health, reduced pollution, greater community spirit – benefits which definitely surpass just an understanding of what an echelon is, or what the yellow jumper means. This is Silsden town centre. 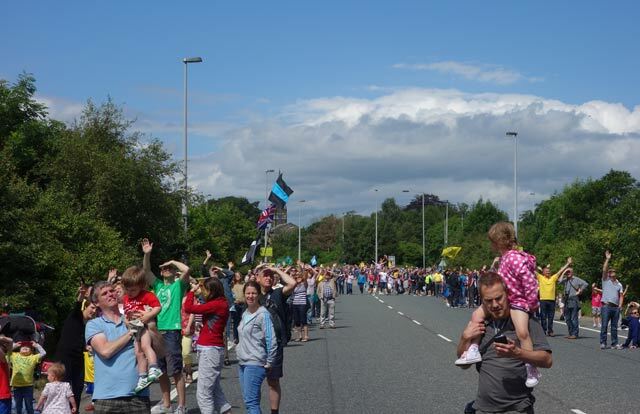 I’ve never seen so many people having so much fun in the middle of the road. Usually we’re in a rush to get somewhere and the car is king. 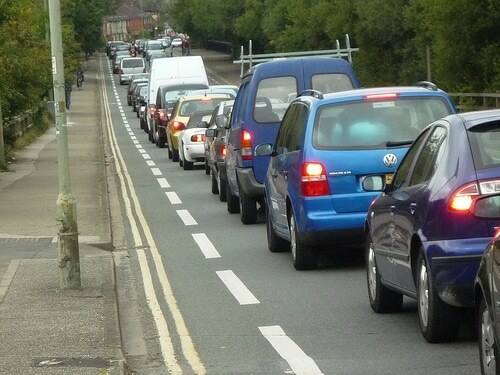 Because we’re in a rush we end up sitting in nice long traffic jams getting frustrated. 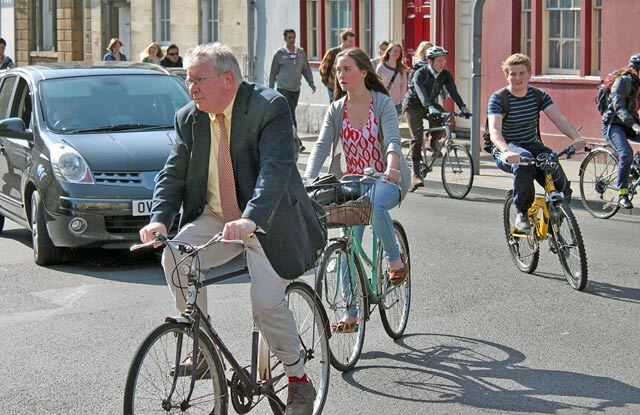 The Tour de France was an opportunity to reclaim the streets, bringing whole communities together. People were having a great time. I’ve never seen so many happy people, not bad to say the action lasted only 30 seconds. In an age of digital communities and instant messaging, it is a relief to remind ourselves that nothing can beat going out into the world and meeting real people. I even broke a habit of lifetime and started talking to strangers by the roadside. The millions by the roadside show that it wasn’t just the attraction of seeing some lycra fleeting by – we actually love an excuse to be part of something big. The Tour was a good example of how there is life after the motorcar and busy streets. It was definitely helped by good weather and having the Tour de France come through, but it shows there’s a lot to be said for creating towns where people can walk, cycle and chat and not just wait for articulated lorries to fly past and the pelican lights to change. 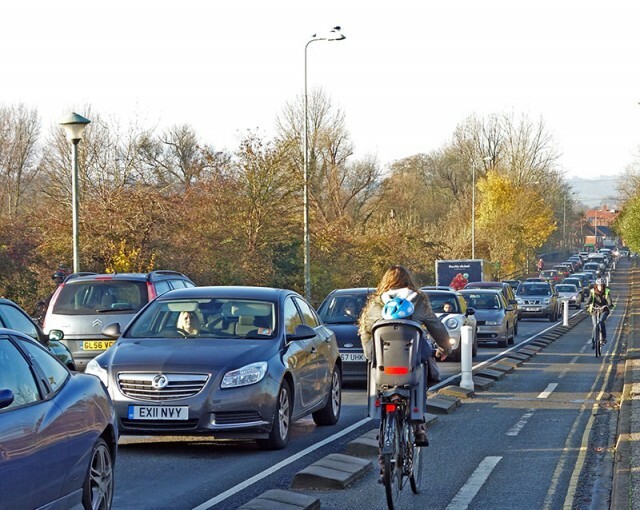 Sundays would make a great time to have more road closures. Life doesn’t end if you can’t drive 24 hours a day, 7 days a week. 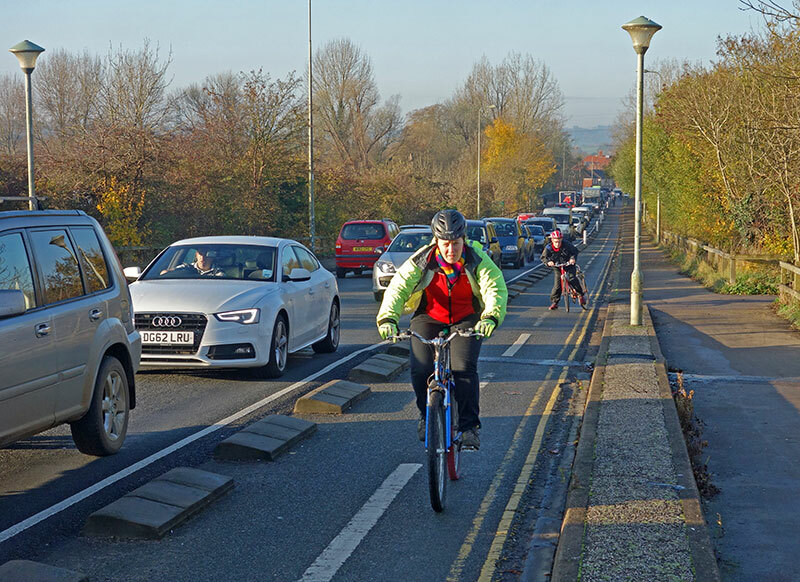 Why cycle in the middle of the road? 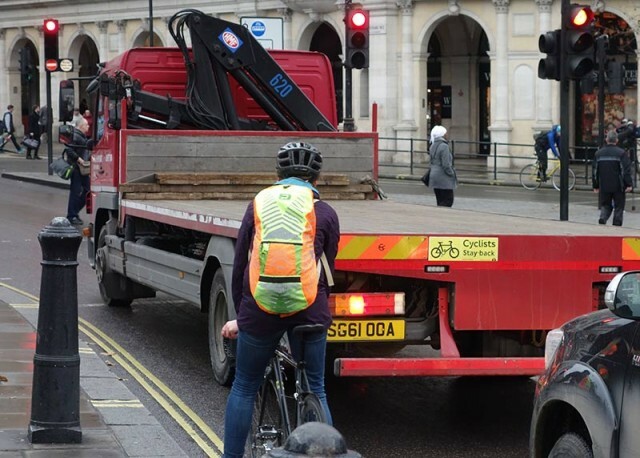 I recently heard a cycle campaigner who suggested that one of the best tips for cycling position on the road is to always cycle one metre from the edge. Interestingly, the Dept of Transport have also given out advice to cyclists that it is advisable to cycle 1 metre from the edge (Direct Gov link). 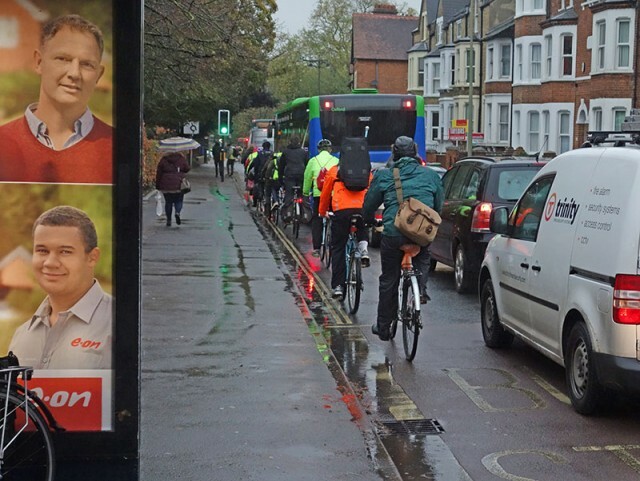 The problems is that although this is good advice, motorists can get very impatient when they see a cyclist in ‘middle of the road’. One metre from edge is just over 3 feet and much further out in the road than the average cyclist will generally be. 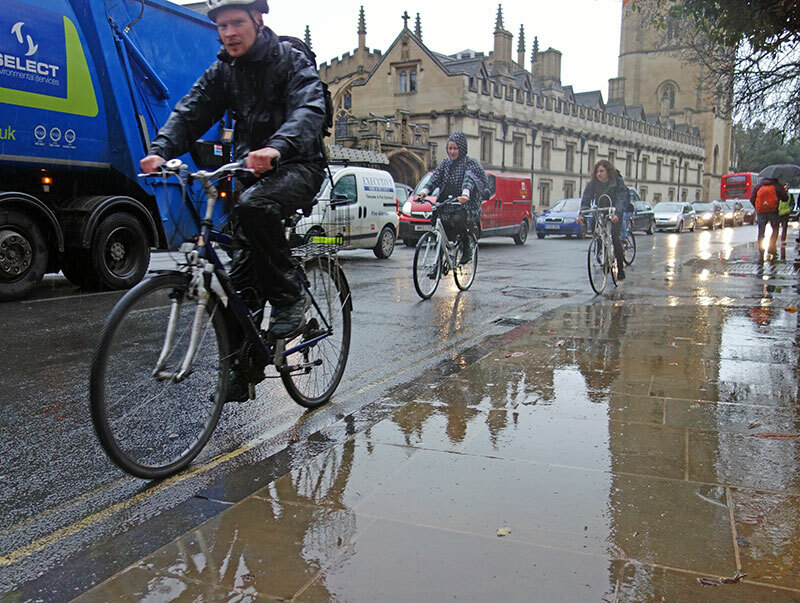 In fact I remember when I was very young and starting to cycling someone told my I should cycle in line with the outside of drains (basically 1 feet). 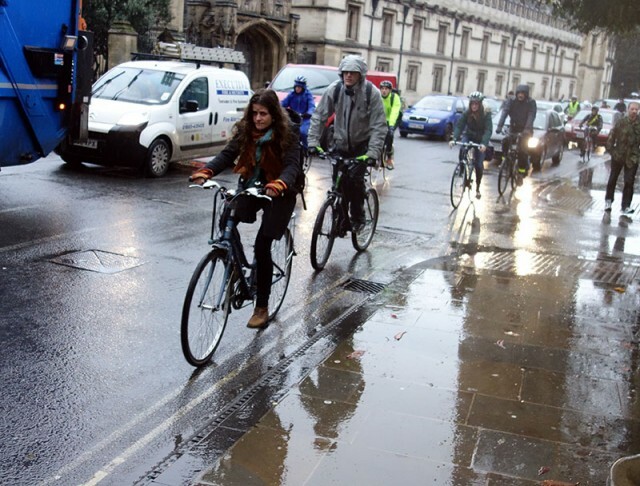 When I was looking through photos of people cycling in Oxford, it was much easier to find people cycling by double yellow lines than it was 1 metre from the edge! 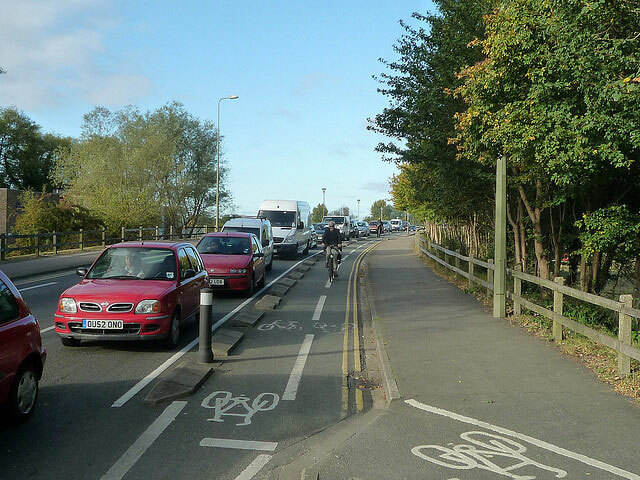 Even Transport for London advise taking the lane in certain circumstances. Stay central on narrow roads. 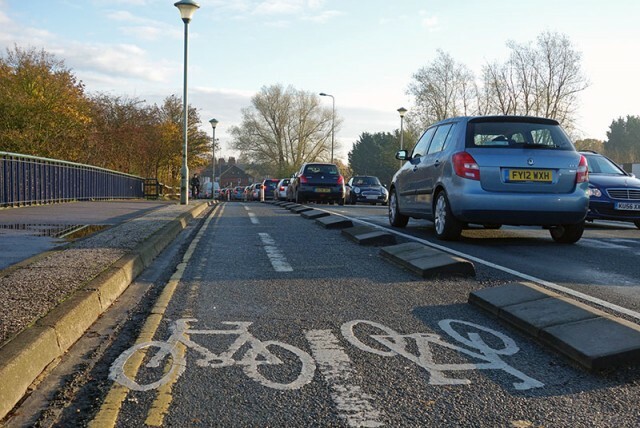 Try to ride away from the gutter. 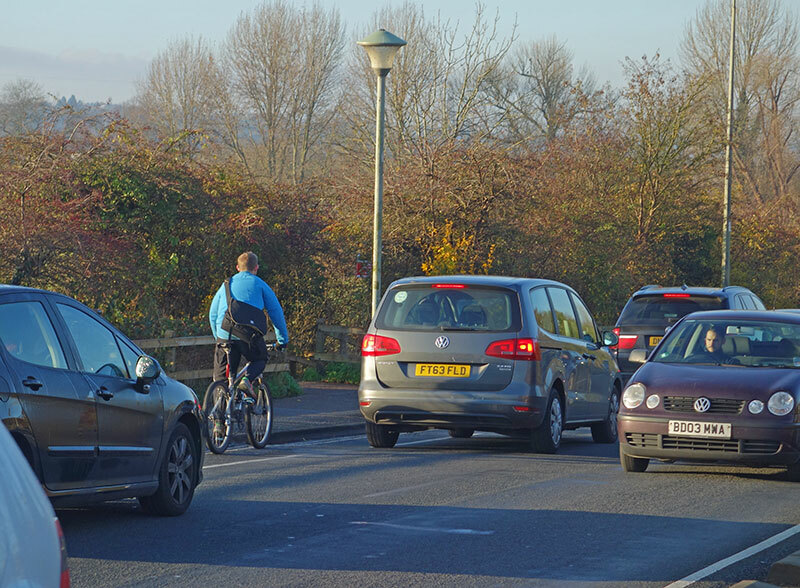 If the road is too narrow for vehicles to pass you safely, it might be safer to ride towards the middle of the lane to prevent dangerous overtaking by other vehicles. 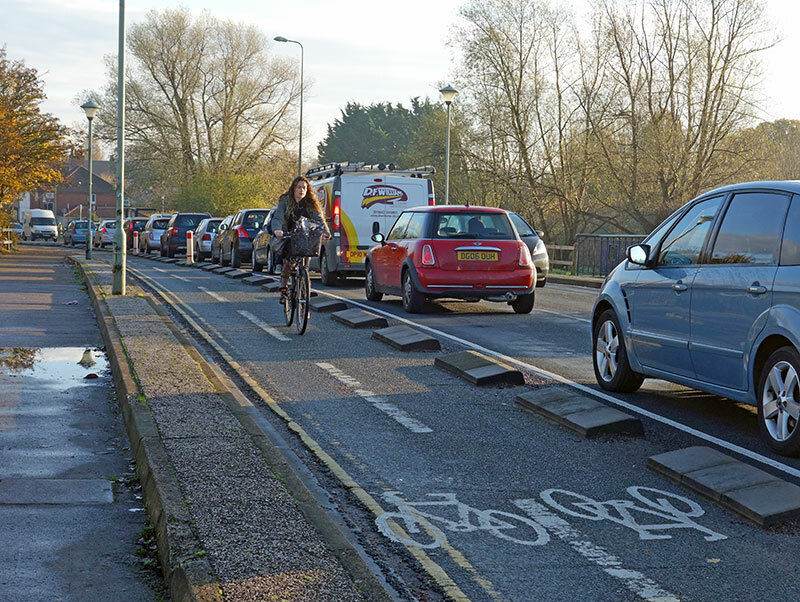 Don’t feel obliged to ride in the gutter. For many years I thought that is where I should be. But, I don’t advise this position. 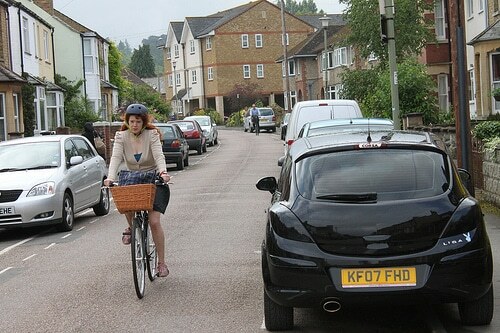 The car doesn’t see the bike hugging the curb. But, he does see Bike 2 out in the middle of the road. You are more visible to cars turning right. 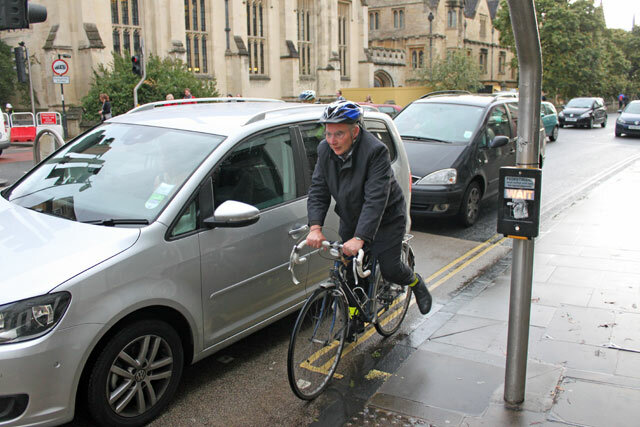 It is harder for cars to turn left just in front of where you are cycling. 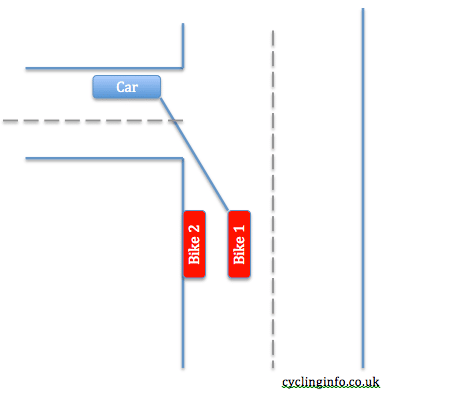 This is a big problem where cars overtake cyclists and then soon turn left, leaving you squeezed on the inside. It is where motorbikes tend to position themselves. 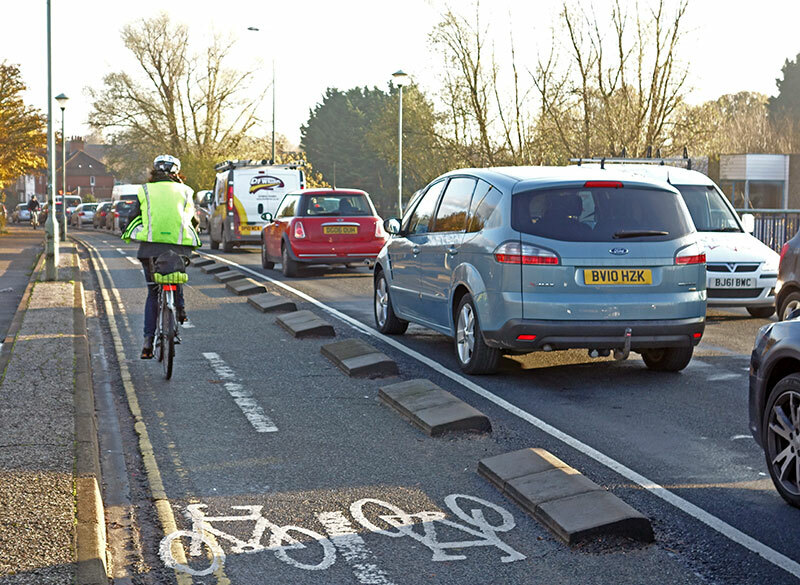 It could make cars more careful in overtaking because they can’t squeeze through when traffic is passing in opposite direction. They have to wait for a genuine gap. 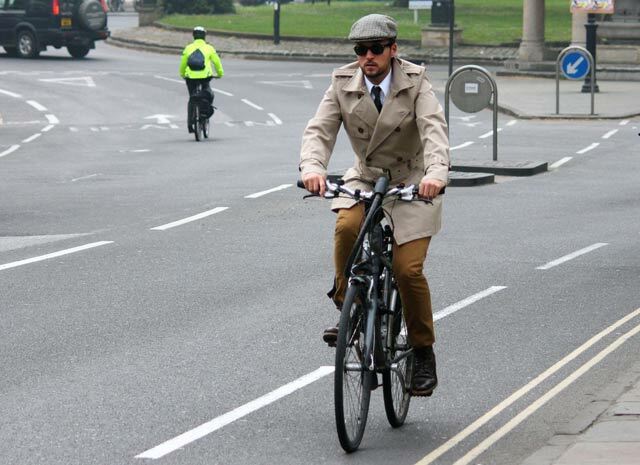 Recently, I was researching an article – Cycling Facts – one interesting thing I came across is how in the 1920s American pedestrians were successfully demonised for crossing the road. A strong road lobby decided it would be good to shame pedestrians who wanted nothing more than to cross the road (and therefore inconvenience motorists). A law was passed making jaywalking illegal (In the US pedestrians can only cross a road at a marked crossing – if you cross the road where you feel like it, you could end up with a fine of $200). But, this law was also accompanied with a sophisticated campaign to make pedestrians seem outdated and ‘dangerous’. – Successfully taking blame away from the real cause of the surge in road accidents – speeding motorists. Clowns were commonly used in parades or pageants to portray jaywalkers as a throwback to rural, ignorant, pre-motor age ways. Another ruse was to provide local newspapers with a free service. Reporters would submit a few facts about local traffic accidents to Detroit, and the auto industry’s safety committee would send back a full report on the situation in their city. “The newspaper coverage quite suddenly changes, so that in 1923 they’re all blaming the drivers, and by late 1924 they’re all blaming jaywalking,” Norton says. Speeding drivers kill every year. In the UK, there are 2,500 deaths on the road. These are not caused by cyclists or pedestrians, but almost entirely by cars, lorries and buses. Yet, speeding has no real social stigma. There is no outrage from British newspapers at the preventable accidents caused by speeding drivers. In fact, the only outrage you are likely to get is the fact that speeding cameras ‘caught you’ i.e. breaking the law.